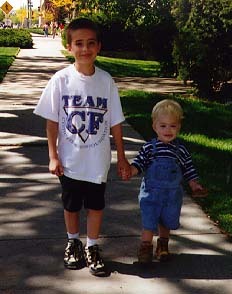 Please help us celebrate National Cystic Fibrosis Awareness Week - OCTOBER 15 - 21, 2000. Let's make everyone aware of CF and help find a cure for this disease. The National Cystic Fibrosis Awareness Committee exists to serve as an instrument for advancing the public's awareness of the genetic disease, Cystic Fibrosis. Our objective is a personal one.The committee, as patients with Cystic Fibrosis and their family members, hold to the hope that through heightened awareness the quality of life for people with this disease will be improved and the lives even lengthened. We believe this aim will be realized through efforts of us as individuals and communities throughout the nation. These pages are filled with pictures of people who fight this disease everyday. They represent the fight from every angle....as friends, family, and as those who have the diagnosis of Cystic Fibrosis. They are infants, children and adults, who treasure each and everyday. We would like to thank those families that have allowed us to use their pictures, helping us put faces and sweet smiles on these pages.